Wellllll, where shall I start? Y’all know I don’t believe in burying the lead, so here’s the long and the short of it: I came down with a stomach bug Friday night, spent all of Friday night and some of Saturday morning getting sick, couldn’t really eat much on Saturday and had to pull out of the marathon at mile 17. Yep. That happened. Let’s back up, though. Friday night I got together with a couple girlfriends to finally watch the Bachelor finale (ugh) and eat dinner. We had a great time, but right before they left my stomach started feeling funny. I went to bed, all packed for my big race weekend and hoping to get a good night’s sleep. Suffice to say, that didn’t happen. I was up every couple hours from about 1am until I got out of bed for good around 7. I was sick all night and woke up feeling and looking awful. I briefly thought about not even going to VA Beach because I felt so awful (at first I thought it might have been what I ate, but now I’m convinced I picked up a bug), but decided to hope that it was a quick bug and that I’d be okay. So I loaded into Mar’s car and we headed off for the beach! I threw up one more time on the drive down (y’all Mar is a good friend) and then just tried to keep it together until we got to the expo.The expo was easy to get through and we didn’t spend much time there. I wanted to rest before the Oiselle team dinner (more on that tomorrow). I should’ve paid attention to the fact that just walking through half of the expo exhausted me. But, hey hindsight is 20/20, right? This was about mile 12 and seeing Mar pumped me up for a bit. I kept on trucking and kept feeling worse and worse. Around mile 15, I actually started feeling dizzy and woozy and pulled off the course to use a port a potty. I was sick again and started to panic. By mile 17, I felt like I was going to pass out. I ran past a bathroom at mile 17, decided I needed to rest for a second, turned around and ran back to the bathroom and then when I came out of the bathroom, a couple of race officials came over and told me I didn’t look so good and did I need help. I really wanted to just push on but by that point, I felt terrible and honestly just didn’t think that I could finish without potentially passing out. So, I didn’t. For the first time ever, I did not finish a race that I started. I am incredibly disappointed and sad that this marathon didn’t happen the way I expected. It’s such a bummer to have gotten sick (I still feel terrible, which makes me wonder how I even ran those 17 miles) and it kills me because my legs felt great. I’m proud of even attempting the race, but honestly, I wish I would’ve just dropped down to the half marathon. This is obviously not the race recap I expected to write, but hey, things happen and I’m learning to keep it all in perspective. Have you ever DNF’ed a race? Ugh, Courtney! I’m so sorry you had the belly bug! GROSS! I was really hoping it was going to be a quick one. Oh you POOR THING! I’m so sorry you were sick 🙁 At least you looked adorable! I DNF’ed my first marathon at mile 15.5 with heat stroke. I was devastated and embarrassed (and hot and tired…) but the best advice I got in those precious few days after that first DNF was “live to run another day”. There will be other races that don’t involve pepto or ginger ale! Thanks Lauren! UGH heat stroke — how awful — that is great advice though. Thanks for sharing your story! Keep your head up, lady! You fought the good fight and did your best- ain’t no shame there. I hope you are back to 100% soon! 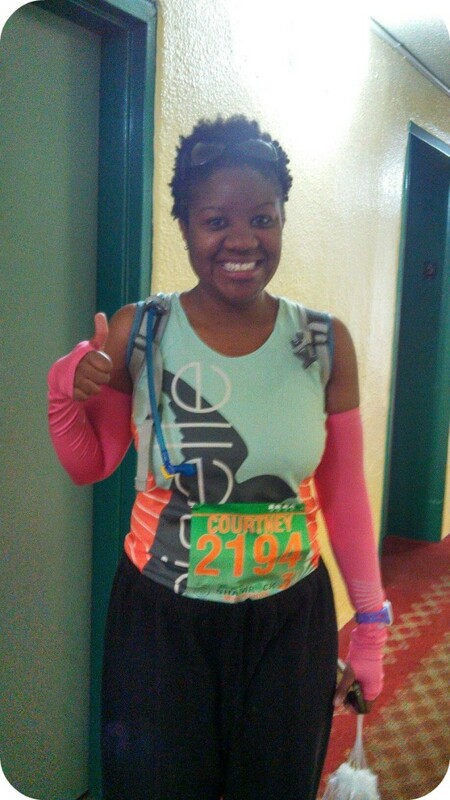 Courtney so sorry that marathon weekend did not turn out how you imagined! I am amazed you got through 17 miles, despite how you were feeling. I am impressed race officials noticed your condition. Hope you are feeling better, you are still a rockstar and so inspirational! Take care! thanks jenny — i’m glad i decided to turn around and head back to the bathroom right at the mile 17 marker. congrats on saturday’s race! Mar @ Mar on the Run! recently posted…Friday Five: Off to the Races!! I hope you start feeling better! Hopefully some of that ocean air got into you and will fix you right up! You are seriously incredible for running 17 miles feeling like crap! Go girl! thanks lindsey 🙂 hope you had a GREAT race! What a bummer! I have to say first, good for you for still trying to get it done and then secondly and even more so, listening to your body and knowing when it was time to stop (stop, NOT quit). We all know how hard that is for us runners to do 😉 Your next races will feel like a breeze compared to this for sure! Hope you’re feeling back to 100% very soon. thanks so much ariana! i appreciate the kind words! I’m so sorry to hear that you got sick, Courtney, but I’m beyond amazed that you made it through 17 miles without having to pull out. It was best for you to listen to your body instead of trying to push even harder and potentially making things worse. As you said, its important to keep everything in perspective. You already know that the past two weeks haven’t gone as I planned, and that my half on Saturday definitely didn’t go as I expected it to. There will be more races, and you and Mar will run a full together. hey kathryn — thanks for stopping by! you are right. sometimes there are things that happen that are out of our control and as frustrating as that is, we have to pick up and adjust. congrats again on your race saturday — great job after a rough couple weeks! I saw your blog on the FitFluential linkup so I am new here. So sorry you had to DNF the marathon :(. I know it hurts but you’re right, there will be more races and it’s best that you listened to your body so that you didn’t get sicker and feel worse, potentially hurting yourself for another race. You seem like a really tough girl and runners are resilient, I would have been just like you and gotten out there and given it a shot too on race day even if I didn’t feel 100%. I have not DNFed a race but I mostly race 5Ks and 10Ks. However, my teammate had to DNF Saturday’s 10K because something “popped” in his leg at mile 2. It’s not a good thing, but I guess there is a first time for everything and tons of great athletes DNF at some point. I guess if I keep running and racing one day I may too. LOL – thanks girl! i was full of adrenaline for awhile! Oh Courtney, I’m sorry you caught the evil stomach flu thing. But, way to go rockstar for roughing it out for 17 miles! You are amazing. I’ve DNF’d as well and it was not my finest moment. I ended up with hypothermia and a pulled hip flexor during a triathlon in October. It was raining, it was cold, and I lasted a mile on the run before I had to bail. This was after swimming a mile and biking 36. Glad it’s not worse and hope you are starting to feel better! oh my goodness! that is so so scary! it sounds like you made a really smart choice to avoid any lasting injuries. yikes. thanks for sharing your experience! At the end I found myself thinking, “no, seriously, how DID you make it to mile 17? !” I know people like to pride themselves on how tough they are for finishing a race regardless, but this sounds more in line with mature and responsible behavior. Thanks Nicole — looking back, I kinda wonder that as well. I knew I did the right thing, but it was a tough decision. oh, court! i’m sorry! well, i say it’s a sheer triumph of your training and your will that you made it thru 17 miles. seriously, that’s crazy! when i’m sick, i get exhausted just walking down the hallway at work. and seriously, way better to not finish and keep yourself healthy than to push your body too far. bodies can be very resilient, but they can also turn on you on a dime! there will be more races! hope you’re feeling better. So sorry you were (and are still) feeling so awful, Courtney! It is SO impressive that you made it to mile 17!!! Lots of people wouldn’t have made it to the starting line, it shows just how determined you are. Hope you feel better very soon! I am so sorry to hear that you didn’t finish, but I’m proud of you for getting as far as you did! I’m glad you stopped when you did and didn’t hurt yourself even more. I know it probably feels awful to not finish but I think you did the right thing. I hope you’re feeling better now! Oh I am so sorry your marathon didn’t happen, but I think it was wise to stop when you did. 17 miles is amazing considering. I never had to DNF but I came close during a half. I got to mile 11.63, yes I looked at my watch and started to feel awful. Me and my running partners slowed way down and I finished. Hope you feel better soon! Really stinks to have to DNF, but definitely the right decision. You’re going to rock the next race! I know it! I was thinking of you yesterday Courtney as I was cheering for my sister. I am so sorry the race did not go as you hoped. At least you knew your body well enough to stop or it could have been much worst. This scares me very much because it is proof that anything can happen to prevent someone from finishing. Nevie recently posted…Doing it all, or trying. ahhhhh – you are amazing. thanks for your kind words, nevie. it really matters. and WAIT??? you sprained your ankle?????? did you run? i have so many questions — omg. i hope you are okay and didn’t run on it!!! thinking about you! Oh Courtney! I started tearing up just reading this. I know it’s heartbreaking – so much goes into the training and I know you were so excited. But you HAVE to listen to your body. I’m glad the race officials were there to help you and that Mar was there to support you. You were TRAINED and READY for that race, that’s all you need. The finish line is nice, but not required. I hope you are feeling better, there are many more races to come! Oh no, I’m sorry you got so sick right before the big day 🙁 I’m impressed that you were able to run as much as you did given the dehydration and not being able to eat. That’s amazing and something to be proud of. It seems like sheer determination pushed you through even that far. I hope you’re back to 100% soon. Sorry to hear you were so sick for the race. I can’t imagine running 17 miles with a stomach bug! You are so strong! But good for your for being smart and pulling out. Risking injury/illness is not worth it. There will be other races that I am sure you will dominate! Good luck! Courtney – There is probably nothing I can say that will make you feel better per se, but know that you are one BRAVE, STRONG, BADASS woman! Most people would not have the guts to even start, let alone the toughness to get through 17 miles. (Perhaps just consider it mental training?!) At least, no matter what, you know that next race will be 100% better!! Oh my gosh you poor thing! How in the world did you ever make it through 17 miles!! I’m really so sorry Courtney cause I know you were ready to rock this thing. Be proud of what you were able to do under the circumstances – amazing in my book! Hope you’re feeling better soon! thanks michelle — definitely the adrenaline took over (at least for awhile) – it was a good reminder that sometimes you really do have to listen to your body. OMG!! So sorry the timing of this was so bad. You are such a rock star..if it were me, I don’t think I would have even attempted the trip to VA Beach. As disappointing as it is, it’s just a race and there will be more, I promise. So proud of you!! Sue @This Mama Runs For Cupcakes recently posted…Cupid Run 5K Recap! thanks sue! so sorry i didn’t get to see you while at the beach but congrats on your great race!!! Congratulations on your perserverance, your determination, your mental strength. Even though you couldn’t finish you have it your all and pretty soon you will be out there rocking a marathon and crushing your PR. You are so brave Courtney! I cannot fathom even going to the starting line with a stomach bug, but I also know the blood, sweat and tears that goes into training for a marathon. Be proud of those 17 miles and use this as fuel for your next race! Keep your chin up! Hugs! Christine recently posted…A support team and gratitude! You’re my freaking hero for your dedication and perseverance! Live to run another day indeed; I recognized the Oiselle kit around mile 7 and then recognized you and I was all “go Courtney!” That was my fangirl moment that gave me a huge boost of energy. 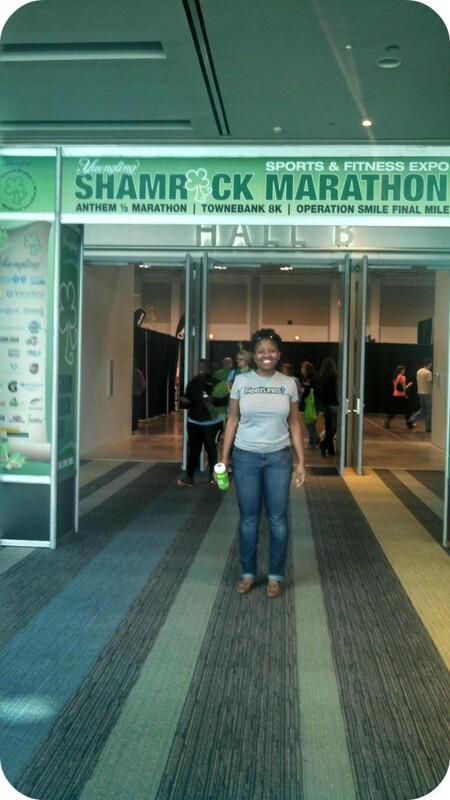 I found your blog shortly after I signed up for Shamrock and am super glad I did, thanks for being so awesome and I hope to see you at another race soon! ahhhh! I thought I heard someone shout my name but couldn’t figure out who it was — THANK YOU! I definitely heard you and it was awesome — how did your race go? I admire you for your continuing to keep to your goal. I have never been one to do a marathon but do exercise regularly and feel it is vitially important for good health. Keep at it and good luck. Visiting from WOW link up. Oh my goodness I am so sorry you went through this! It is incredibly impressive that you even drove down and ran SEVENTEEN WHOLE MILES after throwing up and then not being able to eat anything. Girl I can’t even walk down the block without food! So proud of you! You have to listen to your body. I hope you are feeling much better now. Don’t fret or be disappointed – you went further than I have ever run with NO stomach problems. You will come back stronger than ever in your next race. Popping over from #wowlinkup. You may think this is not a good recap but I tell you what, it tells me more about your fortitude in trying to finish this. This is my second time visiting and it is just very inspiring to me people who run full marathons and try to push through everything to finish a race. I just signed up for my first half marathon and peeps like you just get me excited to experience this! That being say: so glad you listened to your body. Get well soon! I wouldn’t be too upset because you did great considering you had the stomach flu. 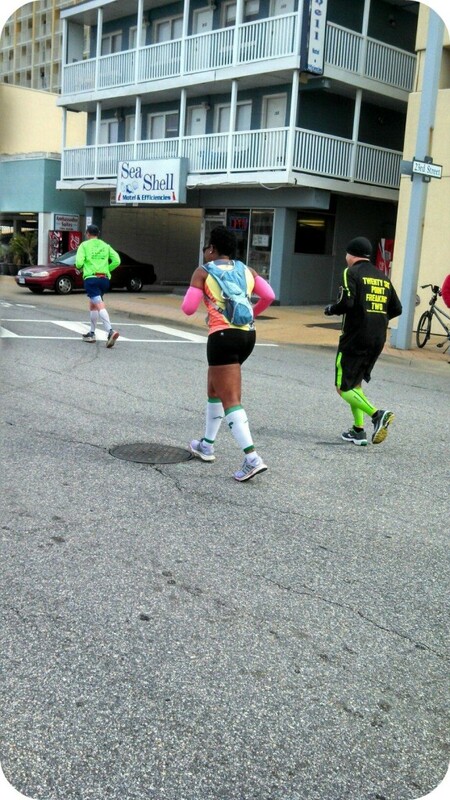 I love the outfit you wore for the St. Patty’s marathon, it was so cute. How long have you been running? Visiting from #wowlinkup.